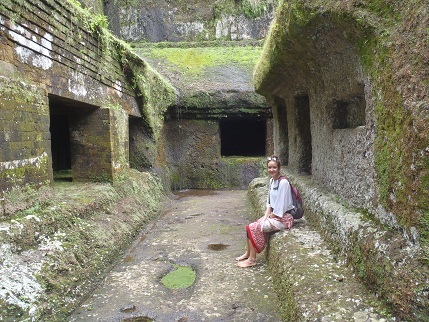 After a week of early morning yoga, afternoon cakes and carafes of wine in the evening, we thought it was time to break our well established Ubud routine and get out and about to explore the sights. We hired a scooter for the day and weaved our way through the polluted fumes until we were surrounded by nothing but rice paddies and a steady stream of much calmer traffic. 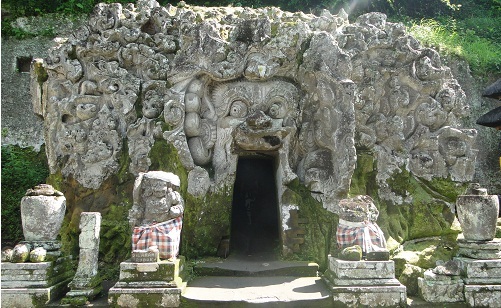 Just half an hour from Ubud and we came across Goa Gajah, or Elephant Caves to the tourists. 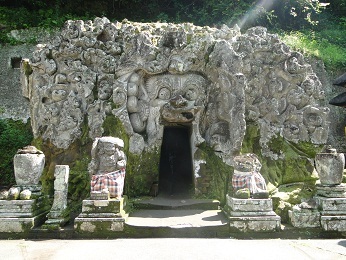 The actual cave had an ornate entrance that looked more like a scary face than an elephant. 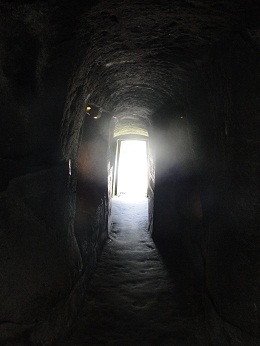 There were more amazingly intricate engravings in the rocks that led the way into a small T shaped tunnels that had alcoves where the usual offerings had been placed. 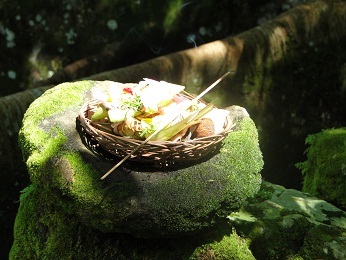 The little bamboo leaf baskets were filled with lovely scents from flower petals, incense and small food offerings to give thanks for the food we have. 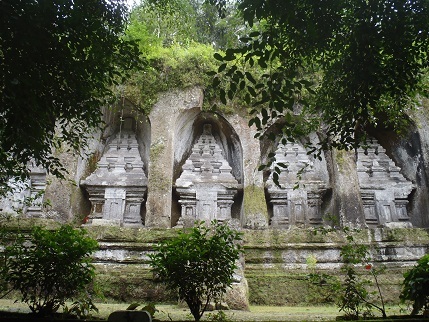 The cave was really impressive but it was the surrounding garden that I liked best. Oh dear, I must be getting old! Little paths weaved up and down and through flower gardens, through rice paddies, around streams, past ponds and beautiful flowers and this was all in the lovely shade of huge, ancient trees. 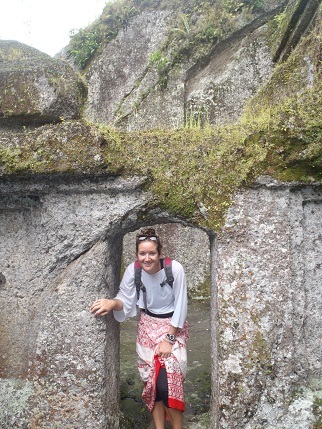 Next we headed to Yeh Pulu, another sacred place that is known for its rock carvings. Unfortunately, I don’t have any many photos from here as my camera had a ‘bit of a moment’ and didn’t save any of the pictures I took. The carvings were cool but the whole thing was fairly unimpressive and extremely expensive. But I almost didn’t mind because there was a funny old lady there who made it worthwhile. She was tiny, about half Sam’s height, with a tight grey bun that perched on the top of her teeny head. She had the kind of sunken, wrinkled face that can only come from having no teeth and from a long life in the sun. She didn’t speak any English but she was eager to pose for the camera in a variety of funny poses before grabbing us, with more strength than you would ever think possible, and pouring water from a little teapot into our hands. She then motioned for us to wash this water over our faces and posed happily for the camera. She especially liked Sam and his purple T-shirt and I’m pretty sure she was miming that he should give it to her but we both pretended not to understand. We did have to give her some money but it was worth it because she was so funny and our pictures were great, so it was a shame when I finally realised that my camera hadn’t actually recorded any of it. 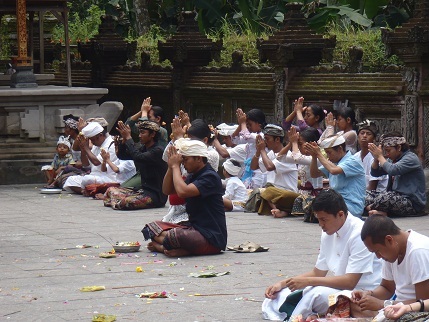 Tirta Empul is a huge temple complex and well known for its holy springs. There were two big pools at the foot of the mountains and we think it was some kind of religious day because it was packed. One pool was filled with men, women and children and the other was just for men. 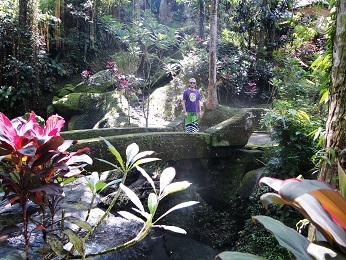 There were about 10 fountains of water that flowed into each pool and came directly from the mountain. The people washed under each fountain and prayed for a second before they moved onto the next. I think that we were allowed to go into the pools but once we got there, if felt too strange and I didn’t want to imitate someone else’s religion. There were many more beautiful temples here and again I thought it was strange that tourists were allowed to wander around and take photos while people were praying. I felt like we were intruding, particularly if it was some kind of holy day like we suspected, so we didn’t stay long. 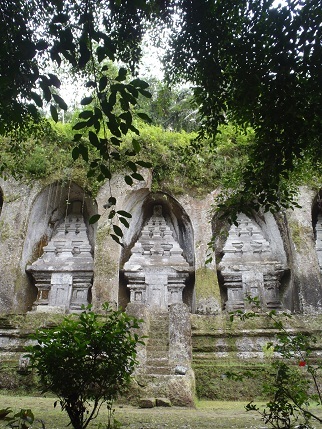 Gunung Kawi is famous for the massive rock carvings. 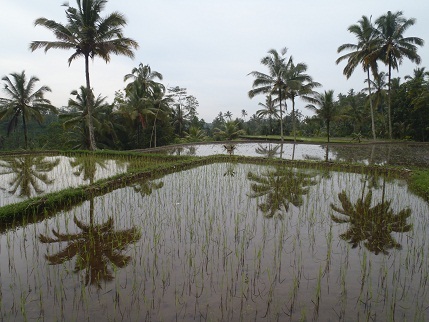 We arrived to a beautiful view over the rice paddies. I’m still shocked every time I see them because I always forget how amazing rice looks. I’ve never seen anything so green before in my life and I love the way they step down and create an amazing pattern in the hillside. Most of the levels of this paddy were being replanted and we stood for a while, watching the men doing this back breaking work under the hot sun and surrounded by a thick cloak of humidity while they were ankle deep in mud and water. 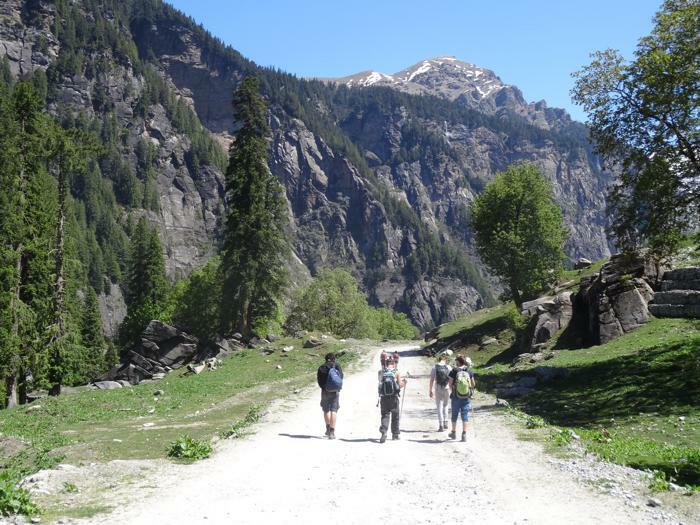 We walked down far too many steps, cringing with every step as we knew we’d have to haul ourselves back up it. Then we saw the massive carvings and knew it was worth it. The carvings were done thousands and thousands of years ago and we couldn’t even comprehend how much hard work must have gone into it. They were massive! And then were massive steps up to the massive arch ways that had massive alters inside. We then went into a cave/house that was carved into the rock and there were lots of religious offerings in the chambers of the cave. 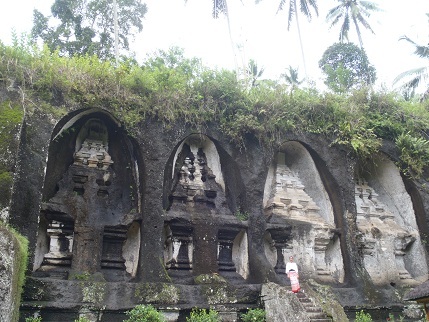 Then there were more rock carvings, as if the first set of three wasn’t enough! There was a pretty garden area with a pond and a little waterfall and stream running through which gave the whole place a really peaceful, magical feel. 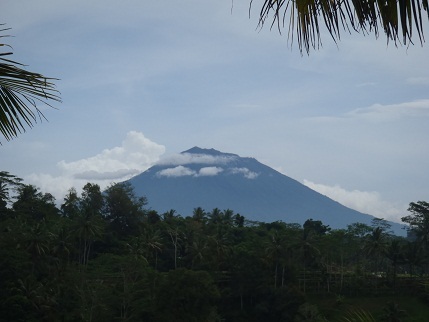 The hot and humid climb back up was tough but we were welcomed by a lovely bar at the top which had a view across the rice paddies, the mountains and even to a distant volcano that had fluffy clouds lingering over the peak. Excellent article! 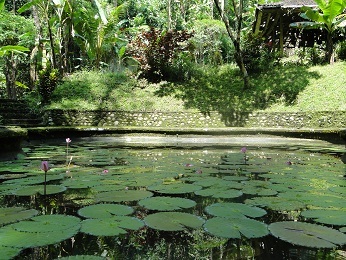 I just got my photos from my travels back today, and came across my ones from my time in Bali and especially Ubud. 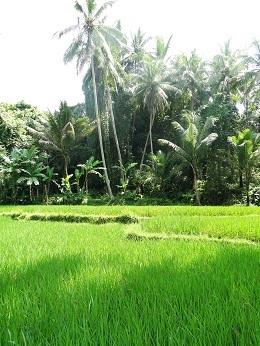 It was such as fantastic town that after a rather scary night alone in Amed, I literally ran back to Ubud! I was initially a bit disappointed by the lack of elephants and caves at the Elephant Caves, but I soon got over it when I say the rest of the backdrop; truly sensational! Haha, an elephant hiding in a cave would have been a nice little surprise! 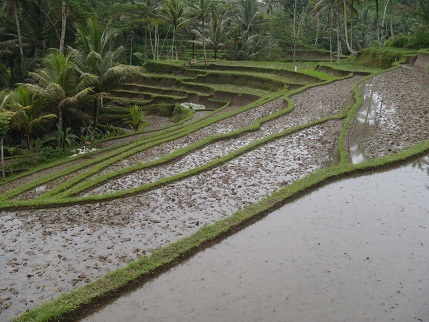 I loved Ubud too, stayed for ages because I didn’t want to leave. 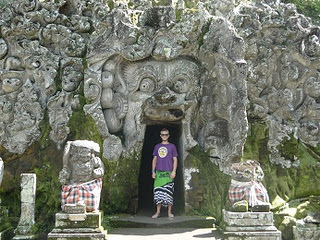 Defo my favourite place in Bali. 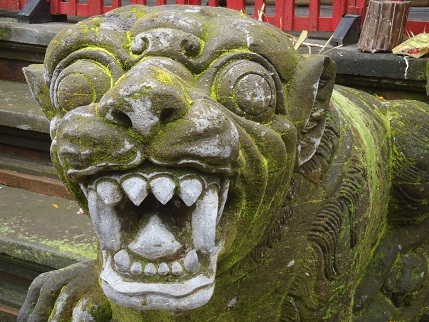 The market in Ubud scared me so much when I first arrived, everyone shoving something in my face, but after the first visit I totally fell in love with it. So many beautiful crafts I wanted to buy them all!